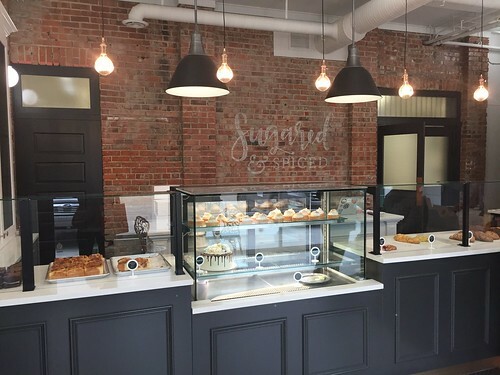 It was without a doubt a banner year for bakeries in the Edmonton area, with no less than ten shops opening up in the last twelve months. It’s been particularly great to see the range of businesses, including French-style patisseries (Macarons & Goodies, Chocorrant, Fan Fan Patisserie, Arno’s Fine French Pastry), fancy cakes and treats (Sugared and Spiced, Art of Cake expansion), and gourmet doughnuts (Doughnut Party, Destination Doughnuts, Frickin’ Delights Donuts in Devon, Ohana Donuterie). Speaking as someone who currently has quite the sweet tooth, it’s been wonderful sampling my way through different desserts and finding any excuse to pick up something new to try. It was a bit of a Jekyll-Hyde year for Ice District. After Rogers Place opened in the fall of 2016, it was assumed that it would be a boon for businesses within walking distance of the arena. While that proved to be the case for certain enterprises (Baijiu, Bundok, and Bottega 104 to name a few), it didn’t prevent some fairly high-profile closures in 2017, including Alta, Vivo’s Downtown location, and Transcend’s Mercer Warehouse branch. Edmontonians seem to have a growing taste for charcuterie and well-made sausage, with Fuge Fine Meats blossoming alongside the opening of two fine meat boutiques in Meuwly’s and Porc Sale. Korean cuisine (including the very popular Korean Fried Chicken) continued to stake its claim in the city, with restaurants including Miga, Yummy Chicken, Hanjan, Pelicana, Hansik, and Dookbaeki opening. Similarly, when it rains, it poured for bingsu, also known as Korean shaved ice. Edmonton went from zero bingsu purveyors to at least four in Snowy Dessert, Snowy Village, Let Eat Snow, and Snow Bear, in addition to other cafes who’ve since added it to their menus. On a smaller scale, the city was also introduced to the world of poke, with Splash Poke and Ono Poke opening up within two weeks of each other Downtown. Those seeking vegan and vegetarian options were able to broaden their choices to include vegan pizzeria Die Pie, Vietnamese restaurant An Chay, quick-serve cafe Good Stock, and The Moth, sister restaurant to Old Strathcona mainstay Cafe Mosaics. Many local restaurants were able to grow their presence with additional locations or concepts, offering diners more unique alternatives. Among them: Monument (Block 1912), Pip (Next Act, Meat), Holy Roller (El Cortez, Have Mercy), Grandin Fish & Chips (The Common), Ong Hanoi Style Fried Chicken (Jack’s Burger Shack, Cerdo Tacos), Salz (Elm Cafe, District, Little Brick), Amore Pasta and Bottega 104 (Cafe Amore, Black Pearl), Wishbone (Three Boars), Mercato Foods (Italian Bakery), Pampa, Farrow, Credo, and Remedy Cafe. I’m always heartened when food truck operators or market stalls are able to transition into brick and mortar storefronts, and this trend continued over the last year. The list included some of the bakeries mentioned above, but also Casa 12 Doce’s La Patrona, Little Village’s take-out spot, and Calle Mexico’s restaurant on 107 Avenue. Food tourism initiatives were another highlight this year: Edmonton Food Tours introduced tours focused on the Old Strathcona Farmers’ Market and Downtown eateries, Urban Pedal Tours offered a unique spin on social drinking, and Edmonton Brewery Tours shed light on the history of brewing in our city. It was interesting that despite the splash made by Cafe Linnea’s foray into no-tipping in 2016 (and their subsequent end to that concept in 2017) there haven’t really been many more examples of gratuity-included restaurants in Edmonton (Grain of Rice and Alder Room notwithstanding). The Alberta Liquor and Gaming Commission made a few welcome shifts, including their changes to licensed patios, and allowance of beer and spirits to be sampled and sold at farmers’ markets. You can check out previous year in reviews here.